The assignment to perform a product review on a car-hauling trailer initially seemed kind of loopy. The assignment to perform a product review on a car-hauling trailer initially seemed kind of loopy. A trailer is a trailer, right? You load up your classic car, tow it to where you’re going, then unload it. So what’s to review? 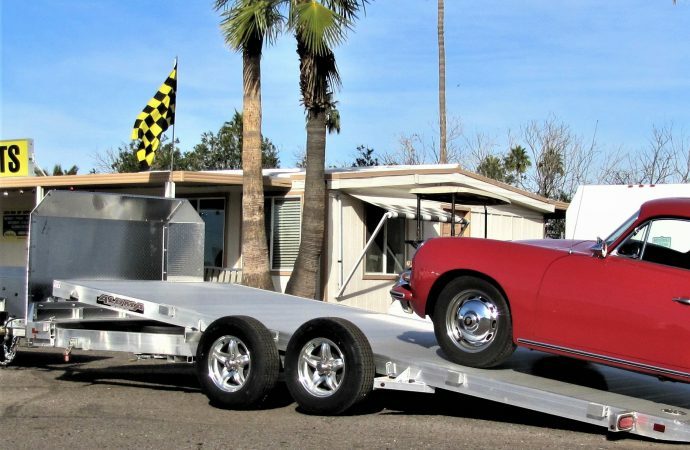 A little bit of research ahead of time convinced me that Aluma’s all-aluminum tilt-bed trailer was well worth checking out because it seems like the perfect accessory for anyone’s old-car hobby. The attraction here is that the tandem-wheel 8216, 8218 and 8220 Tilt models feature a bed that pivots in its entirety, providing a gradual slope for loading without the usual steep ramp to climb or a high-center point to scrape or get stuck on. 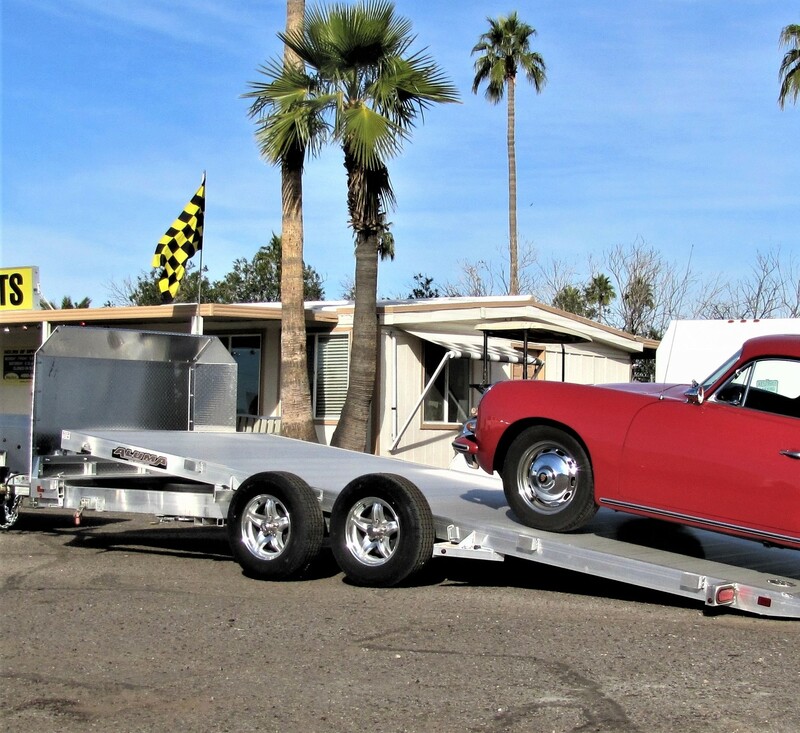 I showed up at Big Tex Trailer World in Mesa, Arizona (no, I did not make that up) in my 1962 Porsche 356 Super Coupe to test the trailer. Granted, the Porsche is not the biggest nor the heaviest sort of collector car, but it’s what I have. The affable general manager at Big Tex Mesa, Loren Biehl, gave me the general tour and demonstration of a 8218 Tilt model with an 18-foot bed. Big Tex also stocks the 8216 Tilt, which has a 16-foot bed. The test trailer was equipped with a diamond-plate rock shield – a must for a hauling a nice old car – and a large tool box. The trailer seemed robust and very well-built. Biehl pointed out the sold construction methods, such as the tongue-and-groove fitment of the bed into its framework rather than just being screwed down. As large as this trailer is, it only weighs 1,500 pounds, according to Aluma, plus the weight of the shield and metal tool box, probably just a couple hundred pounds more. The maximum gross vehicle weight, i.e. with a vehicle on board, is 7,000 pounds. The trick part came when we loaded the Porsche. Biehl loosened a lock-down fitting on the trailer and then walked rearward until his body weight was enough to pivot the bed, which eased down on its hydraulic system until its rearmost edge was touching the pavement. I drove the Porsche onto the tilted bed and slowly throttled it up the modest incline. Biehl instructed me to be ready for the “tipping point,” when the weight of the car would be forward enough to pivot the bed back onto its frame rails. The Porsche, being a rear-engine car, had to go fairly far forward before the bed started coasting downward, which it did slowly and softly. With the Porsche loaded, Biehl relocked the fitting. He also showed the locking valve for the hydraulic system should you want to keep the bed in a certain position. With the bed locked down, I could roll the Porsche rearward to balance the load over the axles. One nice feature of this trailer is designed for those among us who have loaded a car only to discover that the trailer’s left-side fender blocks your door so you can’t get out: the fender can be removed quickly via a pair of large wing nuts. Of course, you still require the foresight to remove the fender before you load the car. To deter potential car thieves, there’s a pair of holes drilled in the thick aluminum structure where you could insert a padlock to prevent the bed from being tilted and the car rolled off. The 18-foot trailer was certainly more than I would need for my 13-foot-long car, so I would probably go for the 16-foot model, which also weighs 75 pounds less. Whichever, I was impressed by the quality of the Aluma trailer and the simple solution it presents for loading your precious classic car cargo. Biehl said the 8218 Tilt test trailer with its accessories would cost around $7,500 at Big Tex, which is a nationwide chain of trailer stores. But whoever is planning to put this present in your Christmas stocking would need to check prices at local dealers, or visit the Aluma website. Price: Approximately $7,000 to $9,000.